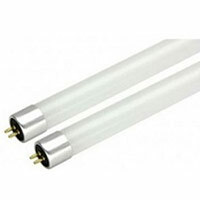 MaxLite Coated Glass LED T5 Linear Replacement lamps are the ideal energy saving choices when upgrading traditional linear T5 fluorescent lamps in fixtures containing standard G5 (mini bi-pin) sockets. The LED T5 lamps are designed to provide appropriate light levels while utilizing a dedicated internal driver and require non-shunted G5 mini bi-pin lamp holders. Tested to NSF Standards, these lamps carry the ETL Sanitation Mark and are suitable for use in an environment where food intended for human consumption is produced.